Sorry I’ve been away, it’s been a bit crazy. Last Wednesday, I busied myself with laundry, cooking, and switching my electric company to one that is nicer, less expensive, and with a US-based call center. With the lovely weather we had after the drowning rains, I’ve also been out on the bike again, every night except Tuesday, when I hit HEB for a stock-up run. I planned on going for a ride when I got home. That didn’t happen. When I realized how much I’d been walking around that place, I realized I already had some exercise–and that wore me out! Thank heavens for the two folks handing out samples of fish, chicken, and a tasty cucumber salad I hope to make again one day. No, I didn’t buy them. This time. Those are chocolate covered strawberries in the perimeter around the cake. I also picked up two more tomato plants for twenty-five cents each. They were on their last legs, but they are planted, and one even has a tomato growing. Fingers crossed for lots of grape tomatoes this summer. And why not take your date to dinner at HEB? Not all HEBs have a coffee shop in the store. Ours doesn’t, but the store in The Woodlands does, and it’s smaller than our new store. Ditto for Cafe on the Run–we don’t have one, but the League City store does as well as The Woodlands. If all these newly relocated people fall in love with HEB, we’ll never get rid of them. Texas will be doomed. Speaking of food shopping, Neighbor E told me last week that all The Fresh Market stores in Texas are being closed, along with two other states. They’ve only been here in our ‘hood for two years. There are now hired security guards at the front entrance, and they’ve reduced the operating hours to 9am to 6pm, until they close on May 18th. That’s how tightly competitive the grocery market is here in Texas–and Whole Foods isn’t doing too good, either. The Fresh Market is selling everything at 50% off, all sales final, so if you’re in the area of one of these departing stores, it’s time to stock up. Between Hancock Fabrics, Sports Authority and now The Fresh Market, that’s a lot of folks in retail losing their jobs in Clear Lake real soon. We went right from winter to nearly summer, but once I decided to put my winter boots back in the closet, we had a front come through bringing cooler, drier air. It’s not really cool enough for boots now, but last Monday morning, I could have gotten away with them. So, last year about this time, I wrote a longer piece on the slow cooker, a kitchen standby that, with a little forethought and planning, can make your regular cooking easier while keeping the kitchen from heating up during the summer, or allow you to cook more at the same time, anytime of year. Just in the last week or two, Ree Drummond made this Slow Cooker Mexican Chicken Soup on her show. I’ve seen Ree use it a couple of times before, and in my last post, I told you about Giada de Laurentiis getting into slow cooking as well. I didn’t mention this in my post last year, but I should have. Giving credit where it’s due, the GER is the reason I got into slow cooking, and I even taught the last boyfriend (“Voldemort”) how to use his. The GER would use it occasionally, but I bought a cookbook so I could use it more often. I’d never had one, and when I was getting ready to move, I bought two. Last year, of course, I also bought replacement parts for them. . .but I told you about that, too. I hate to use the trade name Crock Pot, even thought that’s what I have. Turns out a number of other companies make different varieties slow cookers. My mechanic friend has a Hamilton Beach and I’m trying to coax him to use it more often. But Crock Pot is the original, and it’s a registered company name. So I’ll use them interchangeably. If you have one by Cuisinart. . .well, you know what I’m talking about. 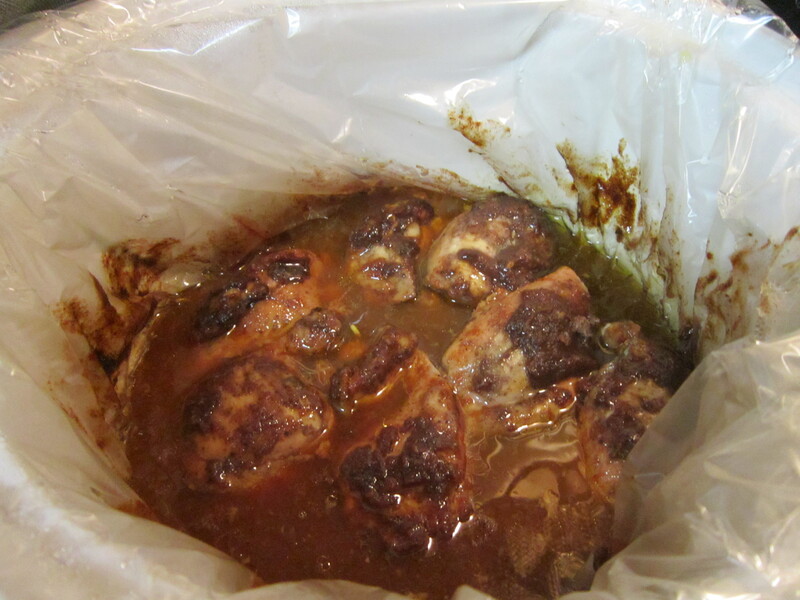 One thing I didn’t mention was the use of the plastic liners available for slow cookers. I hate to buy more new stuff, but I have to say, these liners are awesome. They’re not available in every store, but you might be able to ask your grocer to carry them. They come in a box of four, and I try to buy two boxes at a time. After scrubbing the heck out of my stoneware crocks for years, I don’t ever want to be without them again. With the breakfast quiche I make on Sunday, once it cools, I just lift it right out of the cooker, turn it upside down on a cutting board, pull the liner off and toss it. Cut the quiche, package it up for the week, and I’m good. Just a quick rinse of the stoneware and it’s all done. It really is that good, and worth the money to buy them and extra minute to set them into the stoneware crock. You can read more about Reynold’s wonderful invention here. How come I never think of inventing stuff like this? Dana Carpender isn’t a well-known cookbook author like some of the other folks I have on my shelf. I have two of her low-carb books, and this recipe comes from her 200 Low Carb Slow Cooker Recipes book. It’s one of those “dump-and-go” recipes where you literally put the food in and all that. Pretty tasty, but one of the ingredients is another recipe in the book for ketchup. No kidding, but it’s worth it. I know, it’s weird–but normal doesn’t make the world go round! First, you make Dana’s No-Sugar Ketchup, which is just a few ingredients in the blender and blitzed. I made it the night before and refrigerated it. Came out like gelatin–but really, it’s an ingredient and good. This recipe appears in all of her cookbooks. Store-bought ketchup is usually loaded with sugar, so this is a good alternative if you can’t find something sugarless or something like low carb. Run the blender until the onion disappears. Scrape all of it into a container, then store in the fridge (or freezer for longer storage. At 7½ calories a tablespoon, you can enjoy the heck out of this on fries or anything you like. But that’s not what it’s for today, is it? Really, it’s good. Here we start mixing. Now let’s make this chicken. My favorite part of the chicken, or the turkey. Cover, cook for six hours, and, tah-dah! A little sweet, a tiny bit spicy with a really, really good flavor to it. The book says to serve it with something else called “Cauli-Rice,” a recipe on page 239, but I haven’t tried that one yet. “Cauli-Rice” is simply chopping up a half head of cauliflower by running it through the food processor with the shredding blade and chopping it up small. My local HEB also sells chopped cauliflower ready to saute, which is what would probably be a good way to cook your “Cauli-Rice.” Microwaving it with a little water or steaming are suggested, but I like saute in butter or olive oil until it’s done. But really, any good, healthy side dish would be great alongside this chicken, or (I know I shouldn’t say this) on top of some gluten-free pasta, which is generally. . .not always low-carb. In fact, it would be perfect for spiralized veggies, if you do that sort of thing. Do you have one of them spiralizer thingies? Or have you bought the spiralizing attachment for your KitchenAid Stand Mixer? Um, no. . .and the reason I haven’t delved into it is because I don’t have a spiralizer thingy. Or at least, so I thought. I was out prowling around in the mall the other day, and realize that I actually already have something for spiralizing veggies, and didn’t know it. How did this happen? Well. . . . I was asked to make an apple pie or something for a party many years ago, and I was telling one of the guys in IT Engineering about it. He offered me the use of his apple peeling/coring contraption, and I happily accepted. It worked great! I got them all peeled. . .and then I broke it. I don’t know how, but I broke the darn thing. He was on vacation for two weeks, so I had time to scare up a new one. At the same time, I ordered the red one for myself, and I have used it a few times since then, but not in a while. I was in the mall while the brakes were being worked on, and I saw it in either Macy’s, Sears, or somewhere else that kitchen stuff was being sold when the epiphany happened. Ladies and gentlemen, please welcome The Duchess of El Dorado. This ring would make me “The Countess of Clear Lake.” Still my dream ring, but not as big and bold. Did I forget to mention that they were 45% off that day? No, I didn’t buy any rings. Just a double-chocolate brownie at Starbucks. I needed that more. Oh, yeah, I was talking about food, wasn’t I? So, one day, when I think about it, I will start spiralizing veggies for myself, and see how I like it. Heck, I might actually spiralize something and put it on the waffle iron like hash browns–let’s see what I come up with. For now, though, my attention is elsewhere, including keeping up with this humble foodie blog, and keeping my faithful readers healthy, happy and fed. For now, go get your slow cooker out so you can make dinner tomorrow the easy way.